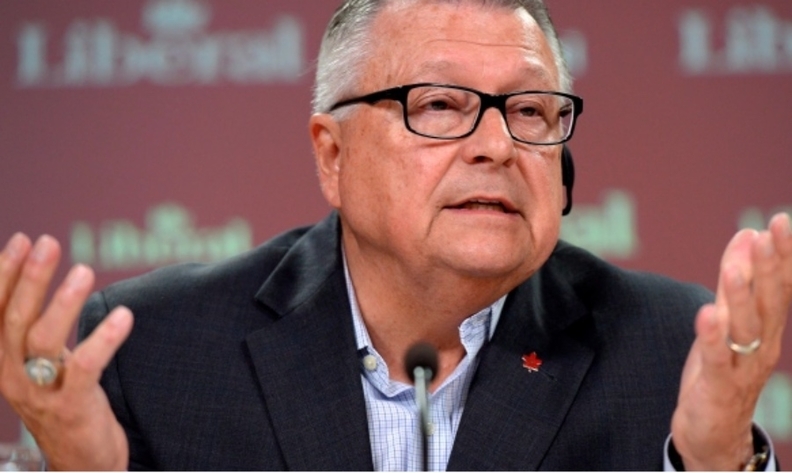 Ralph Goodale says the Canada-U.S. relationship "deserves and demands our careful attention." OTTAWA — Federal cabinet ministers have fanned out south of the border in hope of energizing U.S. supporters of the beleaguered NAFTA deal as yet another critical round of talks is set to begin in Montreal later this month. It is the latest effort to sing NAFTA's praises to the Americans. Agriculture Minister Lawrence MacAulay, Environment Minister Catherine McKenna and Public Safety Minister Ralph Goodale met political and business leaders in the U.S. during the first week of 2018 to promote NAFTA's benefits. Their visits come ahead of the next round of bargaining, which starts Jan. 23 when negotiators from Canada, the U.S. and Mexico reconvene in Montreal. Goodale met with strong pro-NAFTA officials in Kentucky, including Gov. Matt Bevin and the leaders of the state's chamber of commerce. In prepared remarks for his speech Friday, he stressed the importance of identifying and dealing properly with any genuine unfairness in the deal, rather than "tanking the whole relationship." Meanwhile, McKenna travelled to California for meetings Friday with officials, including Gov. Jerry Brown, who also supports NAFTA. Canada's message hasn't changed as it renews its defence of the trade deal, said McKenna, who continues to repeat the mantra that NAFTA is key to tackling environmental challenges and boosting economic growth in all three countries. "I think what we're doing is just looking at all the opportunities to make the case for why NAFTA is really important," McKenna said. One U.S.-based trade expert said the "maple charm offensive" by Canadian political leaders over the past year has been effective at providing outside support to pro-NAFTA supporters in the U.S. Congress. But Dan Ujczo, a lawyer for Dickinson Wright in Columbus, Ohio, doesn't think the needle has moved much for those opposed to or even undecided on the deal. "I don't think hearts and minds have been changed," said Ujczo, who wants Canada to deploy a fresh set of messengers — and messages. It's time to go beyond touting NAFTA's benefits and start acknowledging that there have been some losers in North American integration, Ujczo said — and explain how best to help those people. Canadian businesses should also be playing a bigger role in the U.S. outreach effort, he added. January is likely to be a critical month for NAFTA, since it includes another round of potentially substantive negotiations as well as Trump's latest State of the Union address. Until then, U.S. President Donald Trump's NAFTA message Monday at a convention of the American Farm Bureau Federation will be "an important measuring stick" on how the administration plans to proceed, he said. "While I don't expect the president to make any promises about not withdrawing from NAFTA, I think his comments will add some clarity as to how effective the farm lobby's advocacy has been."